Abbington Green Bed & Breakfast Inn, Asheville NC: An Asheville Bed and Breakfast Knows Where the Chocolate is! An Asheville Bed and Breakfast Knows Where the Chocolate is! About 2 1/2 years ago, I was talking to my (then 5 year-old) granddaughter on the phone. I told her there was a really wonderful place in Downtown Asheville ( so it is not far from our bed and breakfast), that has wonderful chocolate. 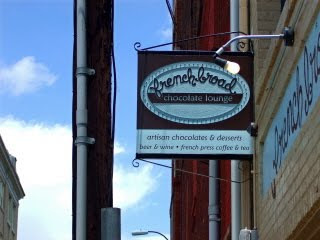 And its name is The French Broad Chocolate Lounge. There was silence on the phone for a few seconds while my granddaughter thought about what I had just told her. Then she said, " Grand'mere, are the chairs made out of chocolate? Are the tables made out of chocolate? Are the walls made out of chocolate?" Ah, the mind of a child! 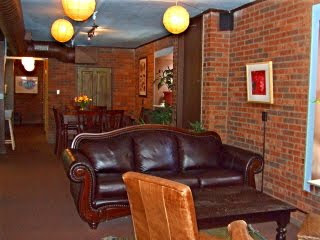 How wonderful to envision the French Broad Chocolate Lounge as a place that's actually made of chocolate! So, I said to her, "Well, you know I'm not actually sure about that. So when we go there with your Aunt Julie and your Uncle Bob (a confirmed, card-carrying "Chocoholic"! ), we will check for you and let you know. In fact, I'll take my camera and send you some pictures in an e-mail. OK?" So, we did. And the answer is, "No, the French Broad Chocolate Lounge is not actually made of chocolate. But, it is a "way-cool" place to eat or drink amazing chocolate treats, prepared by some people for whom chocolate is a life-passion. Dan and Jael, the owners put their heart and soul into chocolate. And it shows.They support sustainable agriculture,and fresh local ingredients. All the sort of business and community philosophy that this Asheville bed and breakfast is proud also to support. Since all of Downtown Asheville NC is actually a Wi-Fi zone, any cafe becomes a 'cyber-cafe'. So you'll always find a variety of people at the Chocolate Lounge including people with their laptop or notebook computer in front of them along with some superb coffee or tea or a glass of wine from the considerable list, and chocolate in some form. And the menu is a sight to see. Hand-made truffles, naturally.Made in smal batches with really fresh ingredients. Some with cayenne, some with tea, some with chai spices, some with maple and sea salt...the list is huge and very intriguing.Chocolate desserts ( and a few non-chocolate items such as creme brulee, maybe with lavender as an extra flavor) also include cakes, superb brownies, cookies and tarts. And don't forget ice cream scoops, floats or that "a la mode" experience on one of those decadent desserts. 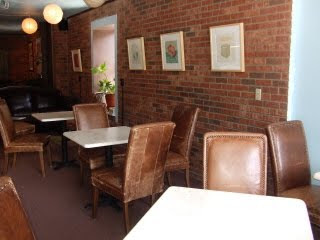 If you needed one more fine reason to visit Asheville (also to include our Asheville bed and breakfast), you can happily put the French Bread Chocolate Lounge on your list!